Charleston, SC The Medical University of South Carolina (MUSC) has been ranked No. 13 out of 500 organizations on the Forbes 2019 list of America's Best Employers for Diversity. In addition, MUSC ranked No. 3 among the 30 institutions listed in the education category. In collaboration with Statista, Forbes surveyed 50,000 Americans working for businesses with at least 1,000 people within their U.S. operations. The goal was to have employees evaluate their employers on issues of diversity in the workplace. The four criteria of the rankings were direct recommendations, indirect recommendations, diversity among top executives and board members, and diversity KPIs (key performance indicators). Diversity KPIs include topics such as the existence of a department or position responsible for diversity and proactive communication related to a diverse company culture. "There are three reasons why embracing diversity and inclusion is of pivotal importance," said MUSC President David J. Cole, M.D., FACS. "First, it is who we should be as an institution. It has to be part of our vision and self-definition. Second, it is how we build upon who we are and what we can achieve together. Third, it affects the bottom line. It is about being our most productive and effective. People who feel valued are empowered to contribute and to be at their best," Cole said. "This noteworthy recognition on the Forbes list, for the second consecutive year, affirms the value and impact of this tremendous body of work that is ongoing," he stated. "To sustain and extend this progress, we must remain consistent, open and committed. Diversity and inclusion inherently yield innovation, and innovation is the key to making meaningful impact." One example of the many tangible advances MUSC has made in D&I is the area of supplier diversity. In support of the local community, Dr. Cole impelled MUSC to prioritize small, women and minority-owned business enterprises (SWMBEs). As of June 2018, MUSC had awarded $60 million in contracts to SWMBEs to help build the $385 million MUSC Shawn Jenkins Children’s Hospital, which is scheduled to open in fall 2019. 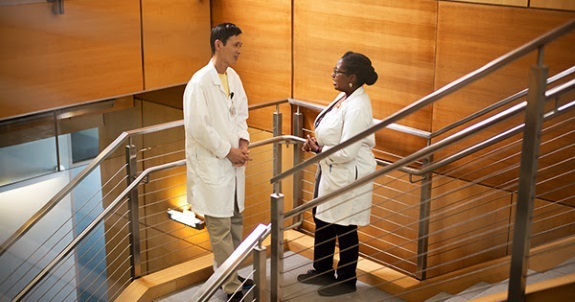 The MUSC chief diversity officers are Willette Burnham-Williams, Ph.D., University, and Anton J. Gunn, MUSC Health. They are supported through strategic collaborations with colleagues and partners across the organization. Each of the six colleges at MUSC also has a diversity officer focused on achieving shared institutional D&I goals. To read more about MUSC efforts in support of D&I, please access the article from a nationally recognized diversity publication that tracks the details of Diversity in Higher Education: www.insightintodiversity.com/wp-content/media/issues/november2018.pdf. In 2018, MUSC earned its second National Award for Diversity and was named a Diversity Champion: https://web.musc.edu/about/leadership/institutional-offices/communications/pamr/news-releases/2018/excellence-in-diversity. Founded in 1824 in Charleston, The Medical University of South Carolina is the oldest medical school in the South. Today, MUSC continues the tradition of excellence in education, research, and patient care. MUSC educates and trains more than 3,000 students and 750 residents in six colleges (Dental Medicine, Graduate Studies, Health Professions, Medicine, Nursing, and Pharmacy), and has more than 14,000 employees, including approximately 1,500 faculty members. As the largest non-federal employer in Charleston, the university and its affiliates have collective annual budgets in excess of $2.6 billion, with an annual economic impact of more than $3.8 billion and annual research funding in excess of $250 million. MUSC operates a 700-bed medical center, which includes a nationally recognized Children's Hospital, the Ashley River Tower (cardiovascular, digestive disease, and surgical oncology), Hollings Cancer Center (a National Cancer Institute-designated center), Level I Trauma Center, Institute of Psychiatry, and the state's only transplant center. In 2018, for the fourth consecutive year, U.S. News & World Report named MUSC Health the number one hospital in South Carolina. For more information on academic programs or clinical services, visit musc.edu. For more information on hospital patient services, visit muschealth.org. Labels: The goal was to have employees evaluate their employers on issues of diversity in the workplace.